Forest Friends: Get (A) Clue! Forest Friends: Get (A) Clue! is a game where players try to figure out the three main facts of an attack against Industrial Civilization: the attacker (animal), the location of the attack, and the weapon used in the attack. We do this so that the animal can be celebrated by all of their fellow forest friends (because there are no forest cops who want to imprison these comrades for their brave actions in this imaginary world). Rather than the library, you’ve got Vail Mountain Ski Resort. Rather than the dagger, you’ve got gasoline and matches. 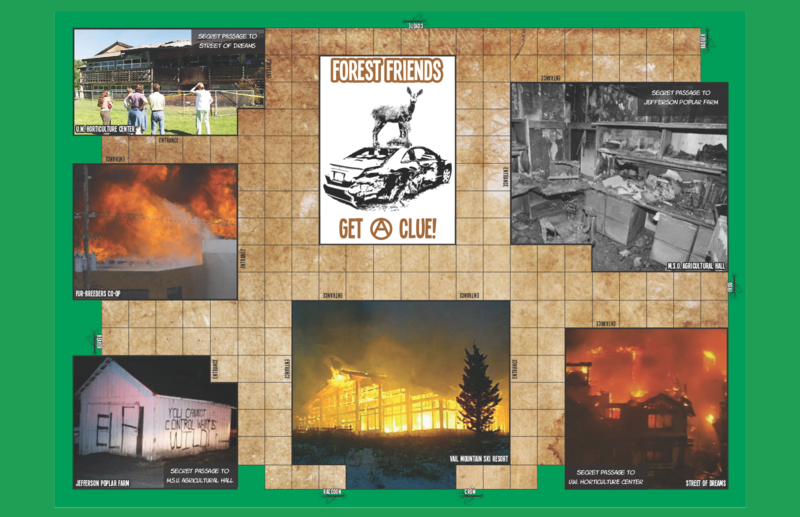 We’ve made the game printable in case other cities want to host similar events, or you just want another way to teach kids this important history. On October 19th 1998 members of the ELF set fire to five buildings and four chairlifts at the Vail Mountain Ski Resort. Resulting in property damages of over 12 million dollars, a communique states that the members committed the arson on behalf of the Lynx, whose habitat would be destroyed by the expansion of the resort. On March 3rd 2008 unknown members of the ELF set fire to four multimillion dollar houses in Woodinville Washington, causing about 7 million dollars worth of damage. A note left on the scene read “Built Green? Nope black!” and “McMansions in RCD (Rural Cluster Developments) r (are) not green.” The note was signed “ELF”. On March 11th 1997 joint members of the ALF/ELF placed five pipe bombs in the Agricultural Fur Breeder’s Coop in Sandy Utah. The bombs destroyed four trucks and leveled the offices of the Co-Op causing over a million dollars in damage. On December 31st 1999 members of the ELF doused the offices in the Agricultural Hall with gasoline and set them ablaze. This arson caused about one million dollars worth of damage. This target was chosen because of the research efforts of scientists working to replace natural crop plants with GMO’s in the poorest nations in Asia, Latin America, and Africa. On May 21st 2001 members of the ELF set off a fire-bomb in the University of Washington Horticulture center in Seattle Washington. Causing over 7 million dollars worth of damage, many scientists lost years of documents and were forced to abandon some of their research, research which was benefiting timber companies. A recipe for nocturnal direct actions! You’re also staying in “Montreal” this summer?